Half the action that takes place at any major motorsports event takes place behind the scenes. 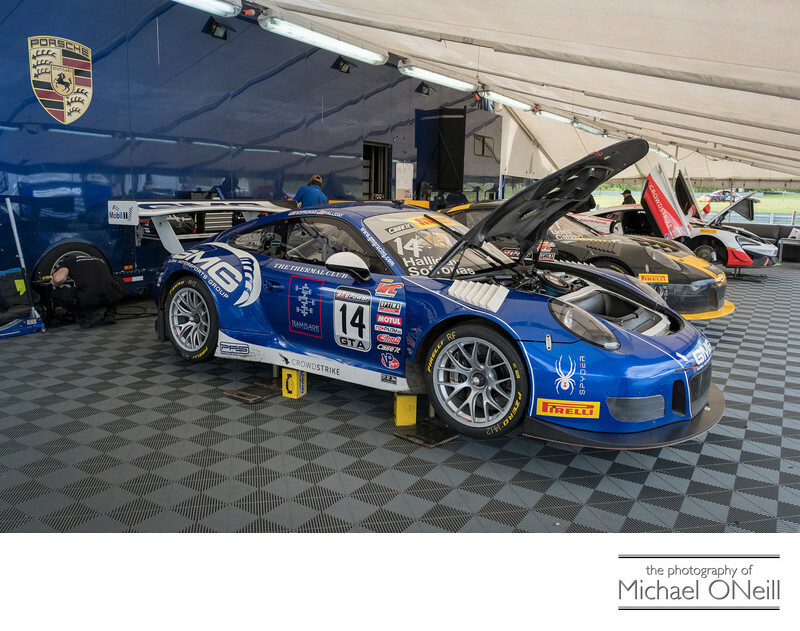 The garage areas and tented team work areas in the paddocks produce some of the most colorful motorsports imagery you will see. Just look through any auto, motorcycle or sports car racing magazine. Check out the editorials. For every photograph you see of the riders and drivers in action you’ll see another image of the race team and pit crews doing their thing. It’s all part of the way races are won in today’s highly competitive speed contests. The temporary headquarters that race teams set up at any given track for a weekend of racing never ceases to amaze me. The haulers are driven in and parked. Tents are erected and floors are put down. Generators are fired up to power everything from the air tool compressors to the hauler’s air conditioning to the team’s coffee maker. This shot is typical of what your average race team sets up for a weekend of racing. This is the Crowdstrike Racing Team’s temporary weekend digs at Lime Rock Park in Lakeville, Connecticut. They are here for two days of Racing in The Pirelli World Challenge (PWC) event. The team’s Porsche and McLaren race cars look very much at home here as they would in a brick and mortar garage or race shop. When looking for a photographer for your next magazine editorial, advertising, sponsorship or public relations effort, look for one who knows their way around the garages and paddocks as well as around the track. A good racing photographer will know who all the key players are…riders, drivers, crew chiefs, tacticians, crew members, etc. Your readers love to see what goes on behind the scenes. Make sure your assignment photographer knows what to cover on track and off. As a veteran portrait photographer I also bring certain skills to the track that others may not. Impromptu portraits of the drivers, team members and VIPs can be handled on a moments notice. If you’re looking for a different photographer with another set of eyes to cover your next event give me a call.